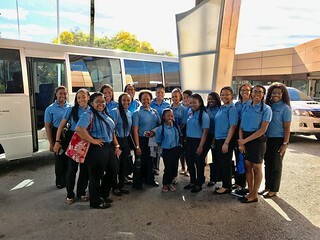 Twenty-two Spelman students traveled to Trinidad and Tobago from May 22-June 3, with Dr. Rosalind C. Gregory-Bass, director of the Health Careers Program and assistant professor in the environmental and health sciences program; and Dr. Alayna M. Blash, associate director of the Health Careers Program. During the Health Careers Global Health travel abroad program, I had the esteemed honor of meeting The Honorable Minister of Health,Terrence Deyalsingh. In addition to learning about the unique culture of Trinidad and Tobago, I had the opportunity to engage in a conversation focused on health disparities that affect the residents of the island. Gaining a political perspective and an understanding of how policies are put in place to promote health equity was extremely interesting. More specifically, I was able to develop a better understanding of how the government is able to provide citizens with free public health services and learn about various initiatives that are being launched to control the diabetes epidemic in the country. Meeting the Minister of Health was the highlight of my trip. I hope to utilized all that I have learned to further my research on health equity and access to quality healthcare in underdeveloped countries.